This is very, very easy to make. Fish cooks very fast, and especially if you like yours more on the rare side (which I personally don’t). With this recipe, it doesn’t taste very fishy and is really quite delicious. Simple and delicious, my favorite kind of meal. It is strict paleo, guilt-free, and great for digestion. I made this for non-paleo guests, and they all loved it. Salmon is an expensive fish, but for six people this is for sure cheaper than going out to eat. I served this with potatoes roasted in duck fat and salad. It is a great, easy, healthy meal. 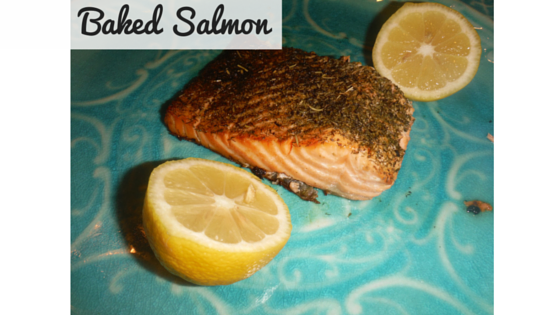 Place salmon on parchment paper lined baking sheet. Pour olive oil over salmon and rub with your hands all over salmon. Spread out dill on top of the oil, and then sprinkle the Italian seasoning, salt and pepper. 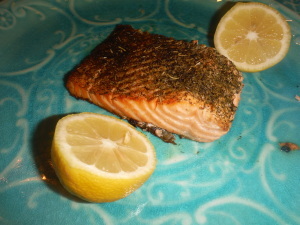 Pour lemon juice over the salmon. Bake for 25 minutes, or to your preferred degree of doneness. Squeeze more lemon on top when it is done baking.